Is there anything wrong with having a hankering for a cookie merely because of its brand name? I mean, Keebler is a cute name, but I don't yearn for a fudge stripe cuz of the Keebler name. Pepperidge Farm is another example - fine name, but not the reason I want an orange chocolate milano. Oh my gosh! My name on a cookie! What a strange spelling for my name. If my name's on it, these better taste good, dammit! After spending a fair amount of time on their website, my hunch is I'll be plenty satisfied and my name safely untarnished. The first cookie on the list to try will be Marnee's Destiny, concocted of cinnamon, sugar, toffee, and walnuts. Yum. Then I'll go for Marnee's Xanadu, a cookie comprised of semi-sweet chocolate chips, butterscotch chips, coconut, and walnuts. 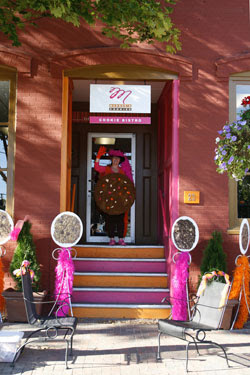 Their store, called Marnee's Cookie Bistro, is located in Bath, Maine, but you can order all the goodies from the website, too. I have yet to make the trek to Bath or order them online, but I really really really really want a Marnee cookie!